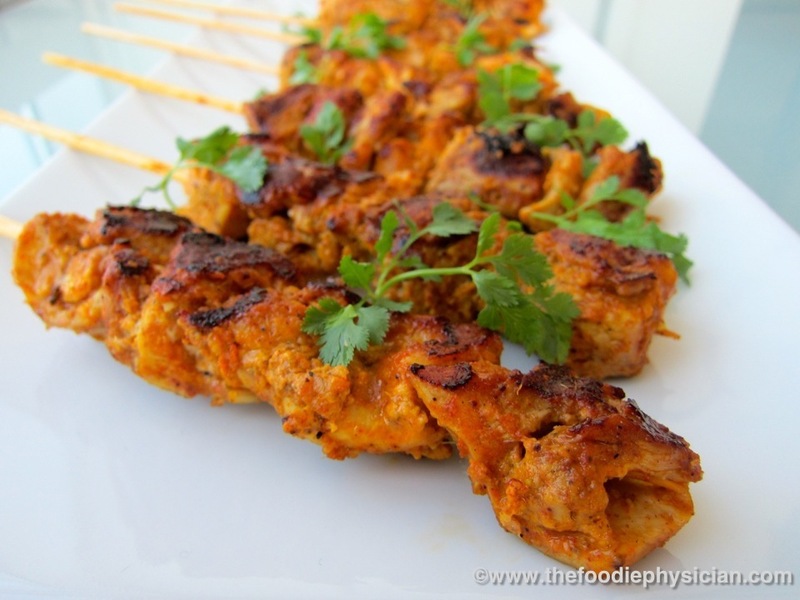 Tandoori chicken is a very popular Indian dish that’s a staple on most Indian restaurant menus. 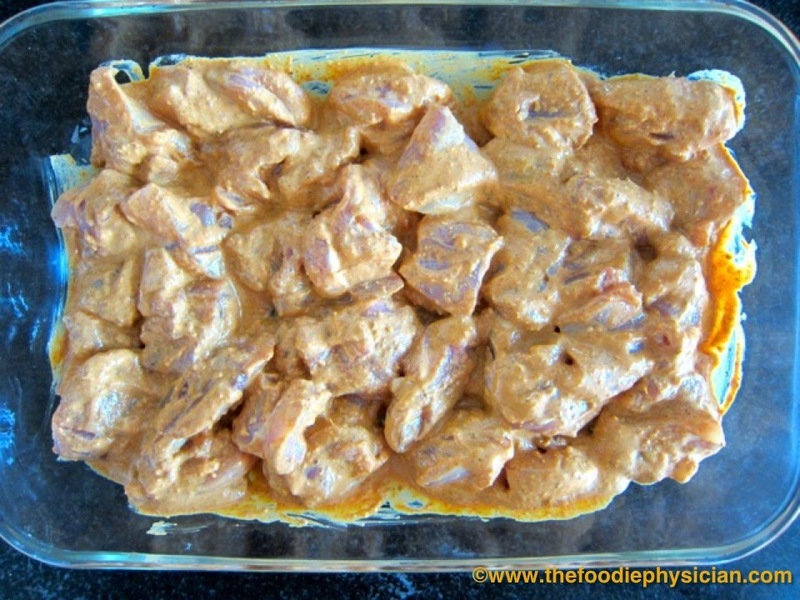 Traditionally it’s prepared by marinating whole pieces of chicken overnight in a flavorful yogurt-based marinade. It’s then cooked at very high heat in a tandoor oven, which is a cylindrical clay oven also commonly used to make naan, an Indian flatbread. Ordinarily, when you cook meat at such high heat, you run the risk of it drying out. 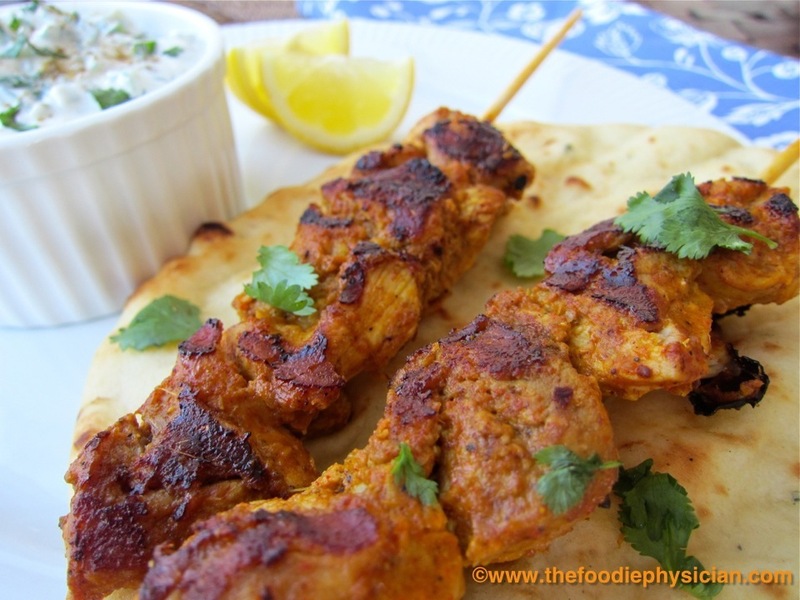 But with tandoori chicken, the yogurt in the marinade helps keep the meat very moist so that it’s perfectly tender and succulent when you eat it. Since most of us don’t have a tandoor oven at home, in my version of the dish, you can use an outdoor grill or indoor grill pan. Grilling is one of my favorite low-fat cooking techniques- it’s a quick, easy and uses a minimal amount of oil, perfect to incorporate into a healthy diet. 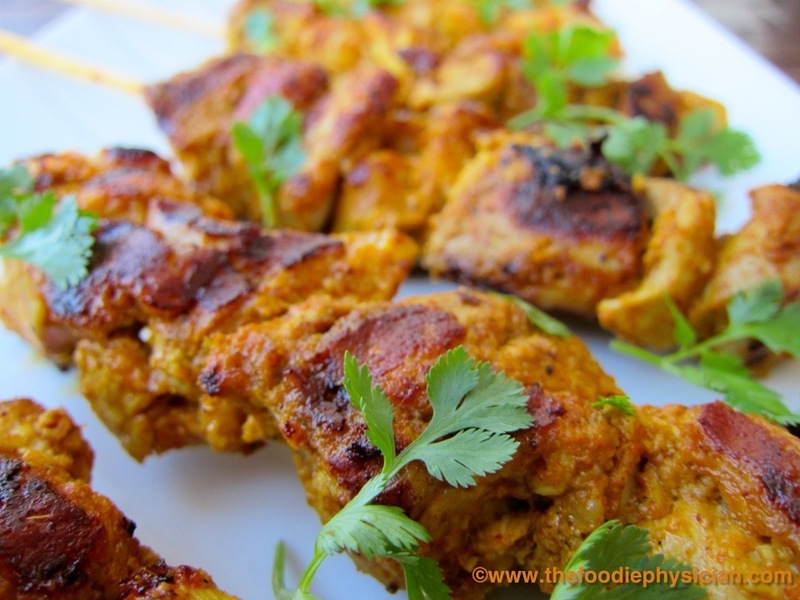 To make this dish a little easier and faster, I like to cut the chicken into cubes and skewer them before grilling. I decided to use boneless, skinless chicken thighs- thigh meat is a great source of protein and is more flavorful than breast meat. Thighs also have the advantage of being a less expensive cut of meat. Chicken thighs stay moist when cooking and are less prone to drying out because they have slightly more fat than breast meat. One 100-gram portion of skinless chicken thighs has 119 calories and 4 grams fat (1 gram saturated) compared to 110 calories and 1 gram fat in skinless breast meat. 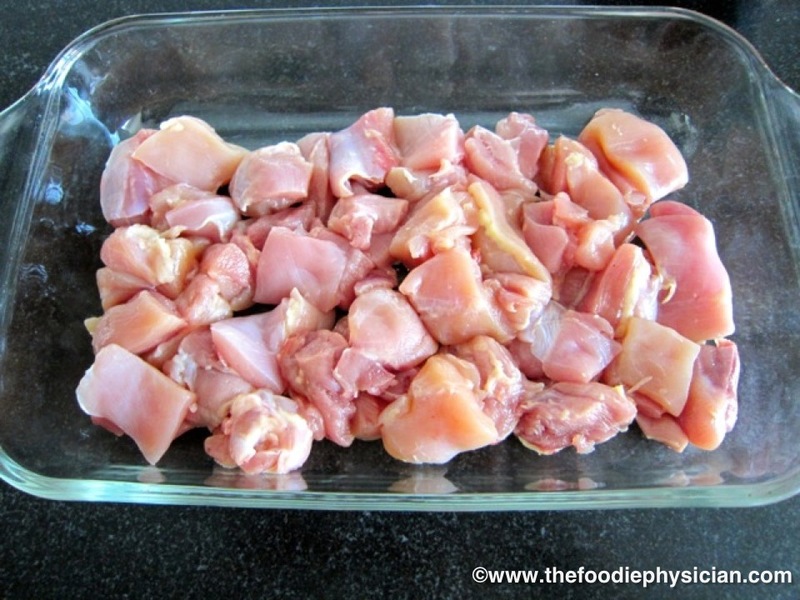 However, skinless chicken thighs can be part of a nutritious diet, just trim off any excess fat before cooking them and use a low-fat cooking method (such as grilling) that doesn’t add a lot of additional fat. If however, you prefer chicken breasts, feel free to substitute them in this recipe. One of my favorite healthy cooking tips is to “spice it up.” Adding bold spices to your food is a great way to add lots of flavor without adding calories and fat and this dish is packed with aromatic spices. Tandoori chicken often has red food coloring added to it to give it a characteristic bright red color. I wanted to stay away from using food coloring so I added natural color with bright yellow turmeric and brick red paprika. They not only give the chicken a vibrant color but they also add an earthy flavor. To maximize the impact of spices like coriander and cumin, I like to toast them whole in a skillet and then grind them up. Pre-ground spices tend to lose their flavor faster than whole spices. But of course if you’re in a rush, you can always use pre-ground spices. Although an Indian dish like this may seem intimidating because of the number of ingredients, the truth is that it’s actually pretty simple to make. Plus there are so many great things you can do with any leftover chicken (stay tuned for more about this). 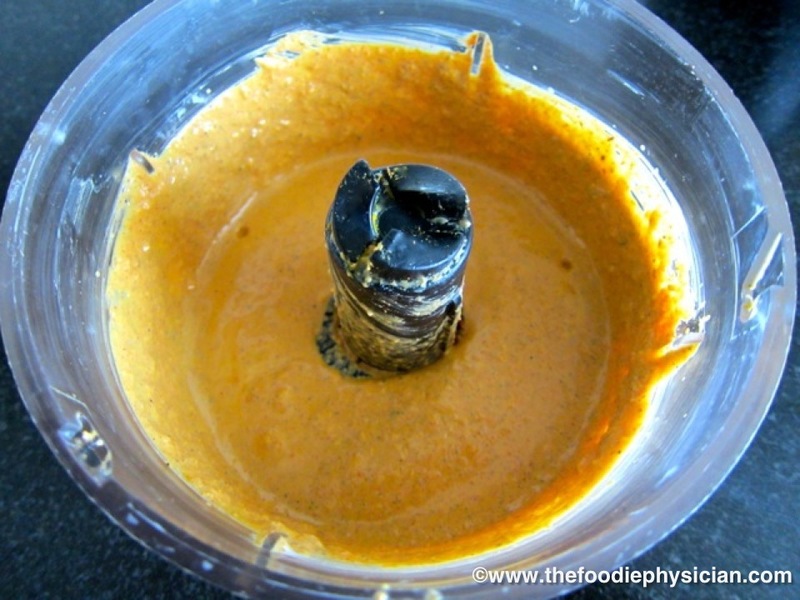 All you have to do is puree the ingredients together in a food processor or blender and mix it with the chicken. 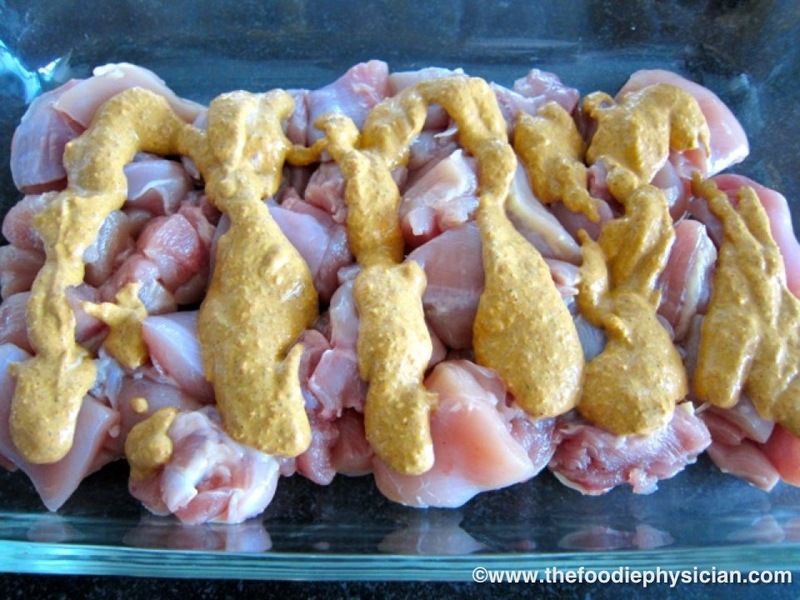 It’s a very versatile marinade and works well with other proteins such as shrimp or lamb. For you vegetarian readers, try this marinade with your favorite vegetables or tofu. To counteract the spicy chicken, I like to serve my kabobs with a cooling cucumber raita, which is a traditional Indian condiment made with yogurt, cucumber and spices. To round out the meal, serve with naan or basmati rice on the side. To make the marinade for the chicken, place the first 12 ingredients (through oil) in a food processor or blender and puree until smooth. Pour the marinade on top. Stir to coat all of the chicken pieces with the marinade. Marinate the chicken at least 2-3 hours or overnight. Heat a grill or grill pan over medium high heat and brush the grill with oil. Thread the chicken onto 8 wooden or metal skewers (about 9 inches in length). If using wooden skewers, soak them in cold water for 20 minutes first to prevent burning. Grill the kabobs about 10 minutes until the meat is cooked through, turning them over halfway through. Remove them from the grill. 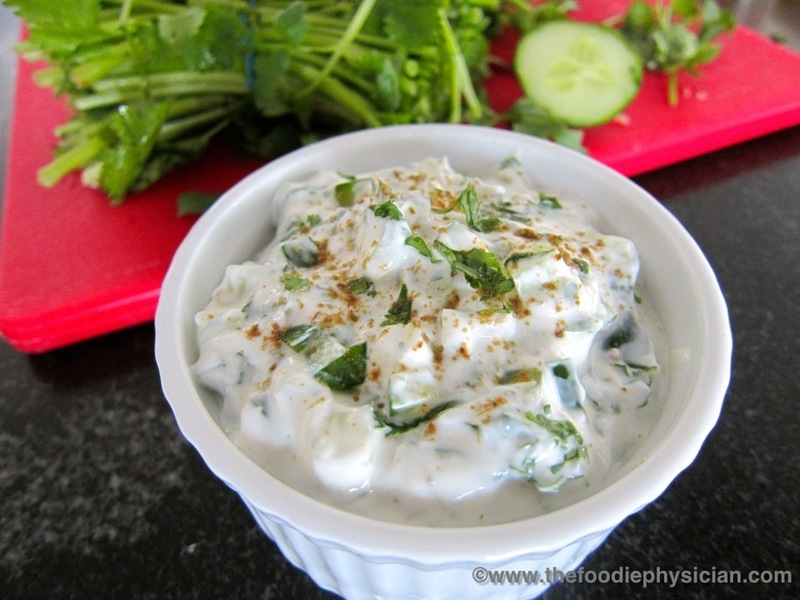 To make the cucumber raita, mix all of the ingredients together in a small bowl. Chill before serving. Serve kabobs with raita and naan or basmati rice, if desired. Garnish with cilantro leaves and lemon wedges. * Garam masala is an Indian blend of dried spices commonly used in Indian cooking. Most varieties contain a mixture of spices that includes peppercorns, cloves, cumin, coriander, and cardamom. If you don’t have it, you can leave it out and increase the amount of cumin and coriander in the marinade. I believe in the “cook once, eat twice” philosophy. When I make a dish that requires a little bit of time in the kitchen, I will usually double the recipe and use the leftovers to create an entirely different meal on another day. Tandoori chicken is a perfect example of this. CLICK HERE to see how I transformed the leftover chicken into a second delicious meal! This sounds Fantastic! I will definitely make this for the weekend. Thanks for stopping by- let me know how it goes if you try it! Love all the spices and I really love using chicken thighs. This looks amazing! I am also very much on the cook once, eat twice bandwagon. It is survival…and can be rather tasty, too! Thanks, Rebecca- I hope you and your boys like this one! Unfortunately, I don't have a good naan recipe but the good news is that you can buy good quality naan at many grocery stores and specialty food stores. These sound and look great. I love tandoori chicken. This was great! Thanks so much! Oh my gosh…my mouth is watering!!!! 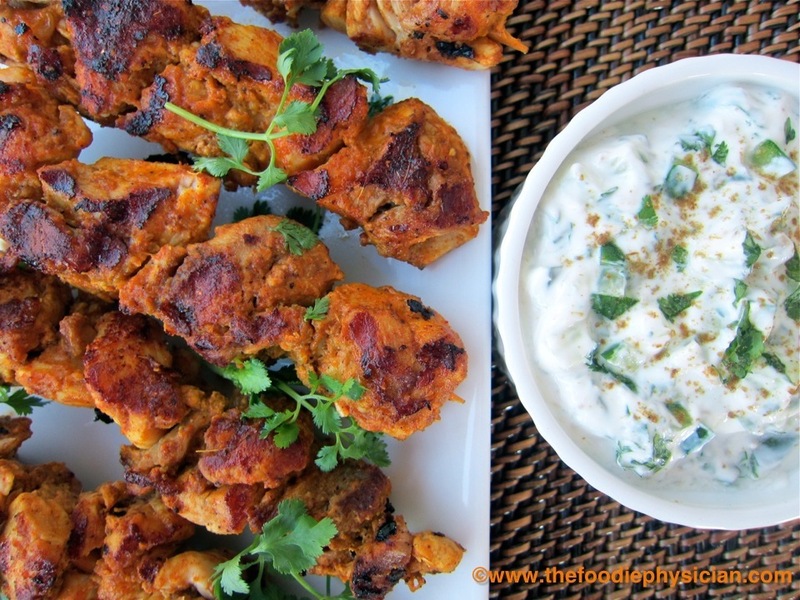 The kabobs are heavenly and that raita looks so refreshing for a summertime dip. Thank you for sharing at Fit and Fabulous Fridays Sonali! A hit at our 50 person party! Ty for the recipe!!!!!! We served it with naan bought from a local Indian Market…delish! Wow, that's great! So glad you liked it! These sound wonderful. I love your food philosophy: healthy really can be delicious. Thanks for sharing! 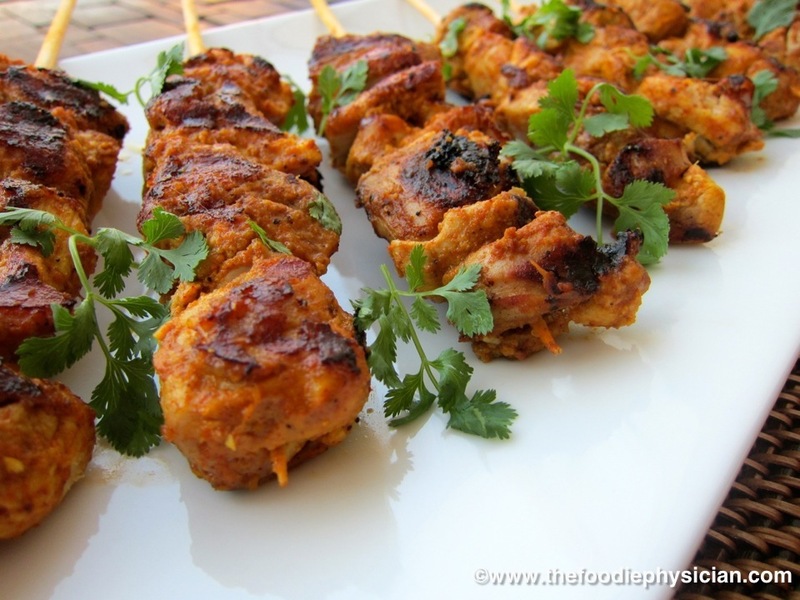 Your recipe for the chicken kebabs have been a big success as appetizers in our parties. You are right, the number of ingredients sounds intimidating but when you throw them in the food processor, it is not that difficult. We love the left over kebabs. This dish look incredible. I love the color on the chicken and the sauce sounds incredible. I made this last night and it was a big hit with the family, it will be in our rotation! Love BBQ chicken and the marinade was wonderful. Thanks for sharing. This is amazing, want to try this at home but I think the ingredients are hard to find. But, I'll try hard to find some of this ingredients. Thanks for sharing this to us. Wow another beautiful recipe. Nothing like chicken kebabs. This is another recipe I would love to try to make with my assisted living clients in the Raymond NH area. Keep the great food post coming! Tried this recipe over the weekend. Absolutely perfect!! Thank you! !